Jam on the nose, the dark purple kind I used to eat with toast as a kid in England….. On the palate, somewhat confusing. 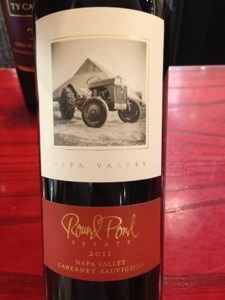 Atypical of Napa Cabernet, I get sublime hints of Herbs Du Provence, plum and cassis Kinda weird and exciting. Sulking beneath this complexity hides a strong tannic frame, very well integrated and adding to the yummy mouthfeel. I am digging this wine, but can’t pinpoint why…. It’s different, fruity, complex and interesting. 92 points and for $39- 4 stars. I think it’s drinking nicely now and will cellar for 7 years at the least.